Cut: "Spiral Cut" - classic competition cut with sportback, FINA approved. This swimsuit style is ordered in your desired color combination directly from the manufacturer. You can choose from 6 main colors (P1), 17 seam colors (H1) and 5 logo colors (M1). The most requested variant with white stitching and white logo we have deposited as a standard variant - but this color option will also custom made after your placed preorder in Japan. The waiting times (till arrival at our company) are at approx 5 weeks. Please tell us your color request for H1 and M1 on the last page of the order process (under "order and delivery comments"), or write us via the contact form (including your order number if you already know). Original Japan Import. Some sizes and colors are maybe currently in stock - you can find all in-stock products here. Please take notice that this is an Original-Japan-Import which is only produced in Japanese sizes - this style is available up to size XO (XXL) - no bigger sizes available. 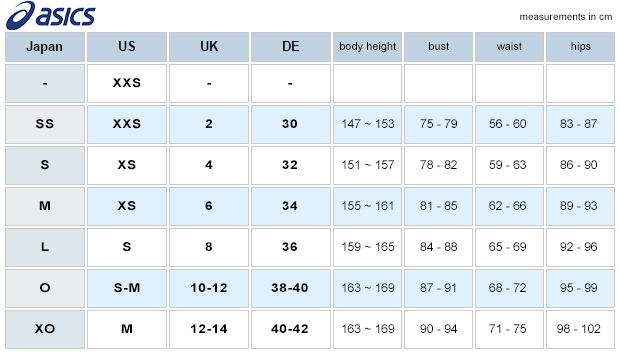 Japanese sizes are much smaller then European or American sizes, please take measurements and compare with the sizechart below.